Every special win or jackpot you get will result in more winnings! 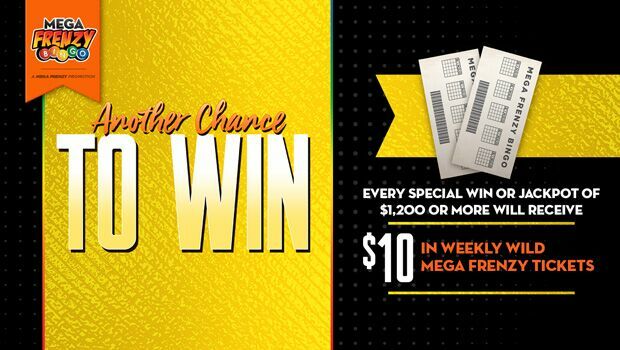 Each time, you will receive an additional $10 in Weekly Wild Mega Frenzy Bingo tickets. This is truly a win-win situation! Chisholm Trail Casino is a governmental enterprise of the Chickasaw Nation, (“Nation”) a federally recognized sovereign Indian tribe. Chisholm Trail Casino is giving away up to a total of $3,000 each month in Weekly Wild Mega Frenzy Bingo Tickets to all qualified Patrons during July 2018 through September 2019, throughout the “MEGA FRENZY BINGO ANOTHER CHANCE TO WIN” promotion. Patrons must be 18 years of age or older with a valid photo ID and must be a Chisholm Trail Casino Players Card member, with complete and accurate account information, to participate. The following individuals or entities are not eligible to participate or win during this promotional activity: employees of Chisholm Trail Casino; employees of the Nation prohibited from participating as set forth by any of the Nation’s policies; regulations, or laws; anyone who has been barred from any of the Nation’s gaming facilities; or any promotional sponsors. Beginning Sunday, July 1, 2018 through Monday, September 30, 2019, a total of up to $3,000 in Weekly Wild Mega Bingo tickets will be given away each month. Patrons will receive $10 in Weekly Wild Mega Frenzy Bingo tickets for Special Win or Jackpot of $1,200 or more. Patrons must have a valid photo ID to receive tickets. No Limit on number of tickets awarded to each Patron. Patrons will receive $10 in Weekly Wild Mega Frenzy Bingo tickets for every Special Win or Jackpot throughout the promotion while funds last. In the event a Patron refuses the tickets, no supplemental prize will be awarded. Acceptance of prize constitutes winner’s permission for the Chickasaw Nation to use his/her likeness or name for publicity or promotional uses without compensation or notice. Winner must agree to sign a publicity release form before prize will be released. Any situation or dispute not covered by these Official Rules will be resolved by the Chickasaw Nation in a manner deemed by the Chickasaw Nation to be the fairest to all concerned. Any such decision shall be final and binding on all Patrons. In addition, the Chickasaw Nation reserves the right to void any entry, and/or change, cancel or modify this promotion at any time without notice. Upon any prize dispute resulting from game play, participants may file a Prize Claim with the Chickasaw Nation, Office of the Gaming Commissioner. Participation in this promotion is an agreement to abide by these Official Rules. Failure to comply with these Official Rules may result in disqualification from the promotion and a forfeiture of any prizes. Participation in this promotion and/or tournament further constitutes the affirmative consent of each patron to the exclusive jurisdiction of the Chickasaw Nation, its regulatory bodies and courts without limit to time or event, which shall govern this promotion.